Apple faced stiff criticism for the introduction of the butterfly keyboard within the MacBook and MacBook Pro computers; the keyboard’s miniaturized mechanism has been shown to be more susceptible to failure when dirt and debris are caught in it. While Apple responded by including a new membrane in the latest iteration of its computers to keep out such particles, it may also have a unique solution on the horizon — removing the old-style keyboard completely. A new patent with the United States Patent and Trademark Office showcases a new invention that includes a transformable glass panel. One of Apple founder Steve Jobs’ original notions when introducing the first iPhone was to point out how much space a stationary, physical keyboard took up on a device. Computer manufacturers have already begun to see the parallel with PCs, and companies, such as Lenovo, have been pushing forward with dual-screen computer concepts that introduce a virtual keyboard. The biggest problem is that glass typically doesn’t offer a form of feedback to alert us that a key has been pressed, or even where they rest within the keyboard layout. 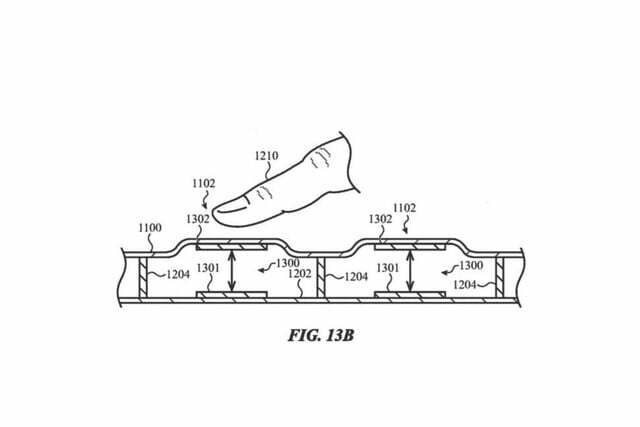 The patent filed by Apple shows a multi-layered system with a transformable piece of glass on the top layer and a touch-sensing layer beneath it. 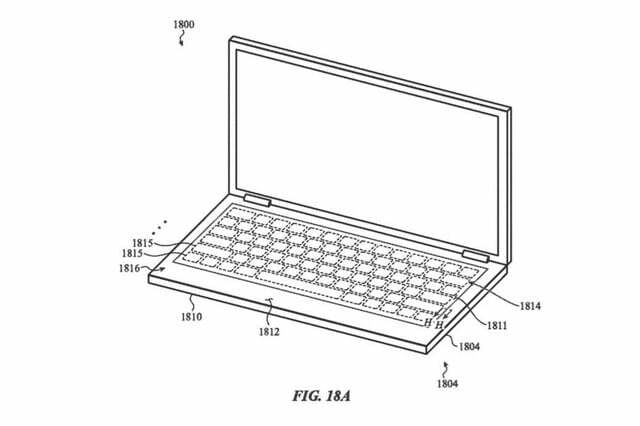 Patent drawings show that first glass layer offers the ability to become altered, potentially allowing the bottom half of the case to house a touchscreen which could then become tactile when the user has the use for a keyboard. This solution would help to alleviate the lack of precise physical feedback from the touch surface when a button is pressed. 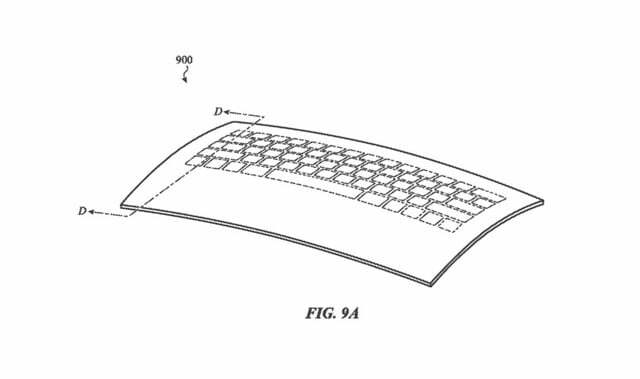 Apple’s patent shows multiple variants of mechanisms that could be used in conjunction with the top glass layer to control how the surface is adjusted, in addition to how feedback might be delivered back to the user. 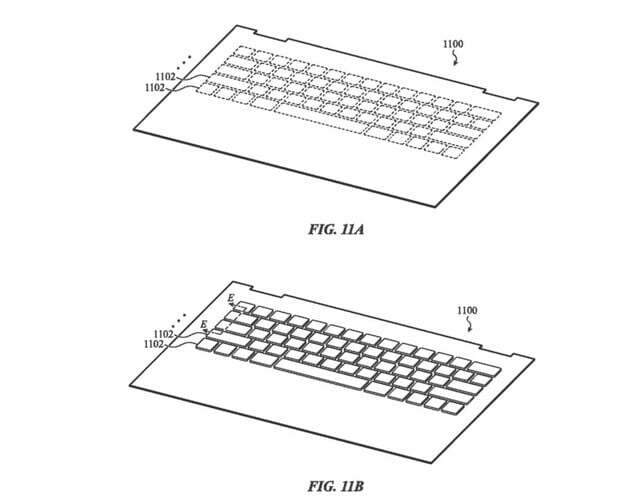 According to Apple’s filings, it appears that the keys are well separated when raised, allowing a typist to find the needed keys easily. However, as with most filings, it is best to take Apple’s patent with a grain of salt, but we wouldn’t be surprised if it was connected to Apple’s Project Star.